The next morning, Mitsue had to go to work early. Although she suggested me to sleep a bit more I decided to leave at the same time. She prepared a delicious breakfast and gave me a lot of gifts!. I was a bit ashamed because the night before I gave her a simple postcard from Nara as a present. As she is a calligraphy artist she gave me one of her pictures. It was the kanji of 'bird' with the shape of a bird. She also gave me a traditional japanese scarf that can be used in a lot of ways. 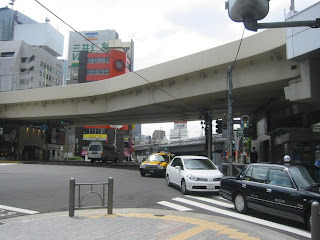 For example, to carry some drinks, cover your hair, etc..
She accompanied me to the station where I took a train to Tokyo. 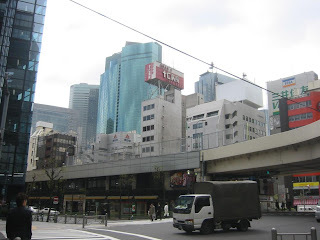 I left my bag in the hostel and went to see Ginza. 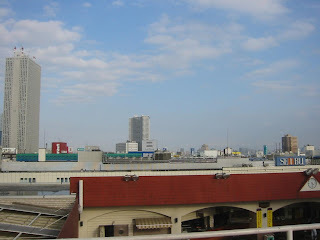 I liked it a lot because of the high buildings and big stores. I bought two books there. One was a Manga (Japanese comic) which was written both in English and in Japanese. The other book was a kanji guide. 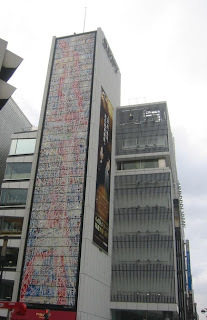 In Ginza I also went to see the Sony building. 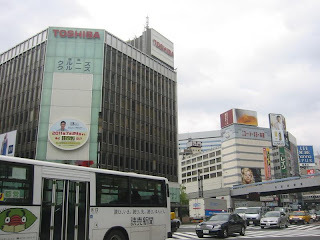 It is a big building with several floors that contain the newest products of Sony. Most of them have not been released yet. I asked the Japanese hostesses about the different gadgets. Sadly, they didn't know anything about Linux. 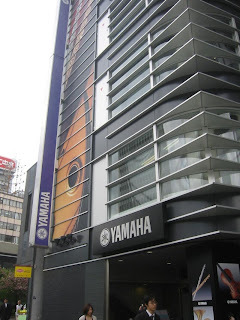 I also entered to the Ginza's yamaha store of music instruments, where I bought two harmonicas. After my tour in Ginza I went to Shibuya to meet two Spaniards and a Colombian that I had contacted to through the internet. We met in the famous statue of Hachiko "the faithful dog" and went to walk through the streets of Shibuya. 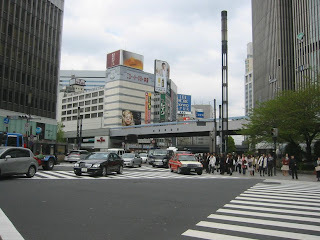 We had a coffee in a Starbucks in front of the famous crossroad of Shibuya, listen some music in a big music store (where April Lavigne was going to present her new album),..
Then, we decided to met at night in Roppongi. I went to my hostel to leave some things prepared and in the way I entered a shop with used manga. 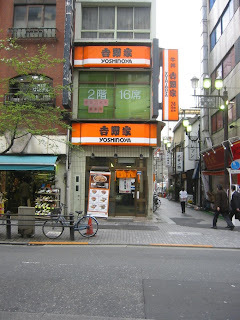 I bought a lot of Mangas there because they were very cheap. Captain Tsubasa, Lupin, Super radical GaG family, Doraemon, Shin Chan. I chose those that were written with Furigana (the reading of the Kanji). We took a lap in Roppongi but the most important discos were closed because it was Thursday. I wanted to go home and go out the following day to see the big discos that appear in Babel, but I finally decided to stay with the Spanish guy and we went to the only disco that we could found open, the Pure. It was a bad decision, I didn't enjoy that night very much.